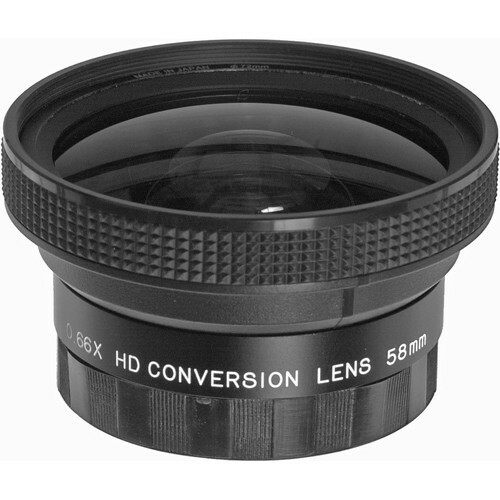 The Raynox HD-6600PRO58 is a 58mm high-quality wide angle converter lens especially made for distortion-free images that cover 33% more area than the base lens. Using a sophisticated lens formula that controls color aberrations and produces a resolution power of 350-line/mm at the center, this 0.66x converter fits on lenses with 58mm filter threads and can be used through the full range of a zoom without vignetting. Box Dimensions (LxWxH) 3.7 x 3.7 x 2.7"
HD-6600 Pro 58mm 0.66x Wide Angle Converter Lens is rated 4.3 out of 5 by 15. Rated 4 out of 5 by brh721 from Awesome lens! I bought this lens because I love my Canon 50mm f/1.4 but sometimes the 50mm is just too narrow. I can't spend the money on a dedicated wide angle lens, so I knew I wanted a converter. This seems to be the best one out there. I've used other converters that create very significant distortion and, while it can be cool sometimes, it's not worth it to buy a cheap converter if you want to have crisp shots. With this lens, my 50mm becomes about a 33mm and there is hardly any noticeable difference in quality. Rated 4 out of 5 by The Fawja from works well over all on my G9...... This is a HIGH quality lens, gives you WIDE hi-def shots with minimum bulk and weight (lightest and smallest I could find) all that with almost no distortion, On the down side this lens will crash before full zoom on my Canon G9/G7 but this is not a big issue anyhow as it is for WIDE ANGLE shots not ZOOM and can be removed with the push of a button. also there are virgnetting issues in full wide - just something to be aware of.......all an all great lens for the purpose. Rated 4 out of 5 by Mosca from A good addition for the Canon G9 This lens is well constructed and is consistently bright from the center to the edges. It has an advantage over the Canon lens in that it accepts filters. There is some vignetting, so you have to zoom in a bit. Overall a decent addition for the point-and-shoot user who doesn't want to go all out into the world of DSLR. Be careful, though; too many accessories and you might as well get the more expensive camera to start. Keep it small and light. Rated 5 out of 5 by Chris B from Great for the price I bought this for my new Canon Vixia HFS200. Since this is a mid-priced camcorder, I didn't want to spend the bigger money for a Canon or Century, and I thought I'd give this a try. ...Quality of build seems great. Screwed right in to my 58 mm mount. Image is great, with no vignetting. Takes my Canon to about 26 mm wide (35mm equivalent), which is just short of fisheye, so you get just a touch of distortion, esp when panning. Not too big or heavy, so it doesn't add a lot of size to the camera - just enough. Rated 5 out of 5 by greenflash00 from Great lens! Quality is Absolutely Superb I bought this lens for my Canon Vixia HF S200 to shoot indoors with and it really does the job. I can see little to no distortion on the edges and it gives a great image quality. Lens is nice and heavy so you can tell it's very well made. The middle ring has a nice ribbed rubber grip that helps in screwing it on or off to the camera as well. I have found this to be a cheaper alternative to Canon's WD-H58, and every bit as good. Get it, you won't regret it! Rated 1 out of 5 by Baixo from Rear element projects too far This lens is pretty highly rated for a converter, but I never really got a chance to use it, as the rear element projects so far that I would have needed a spacer ring to prevent it from hitting the front element of my Olympus 14-42mm zoom or the UV filter I usually keep on.